I was delighted when Jason Nugent offered me an advance review copy of his new book. I'd reviewed his previous collection, Almost Average, and loved it, a great introduction to his work, so I was keen to see more from him. Moments of Darkness is a collection of 14 short stories - some flash fiction, some a little longer, but all of them a quick delve into different worlds. I love the impish fun of Careful Study, with a grumpy alien with a grumbling stomach landing on a new planet. I really like the scritch scratch at your brain that is the insidious madness of Super Moon, with the protagonist becoming obsessed by lunar madness. The dark paranormal tale of With All My Love would fit neatly on a series of The Twilight Zone. Some of the stories are little more than nuggets, vignettes with a twist, but that's flash fiction - I swear, a form I can never master myself, but I respect those who can be more succinct. As ever with a collection, there will be stories you favour over others, but Jason Nugent has a voice worth listening to. 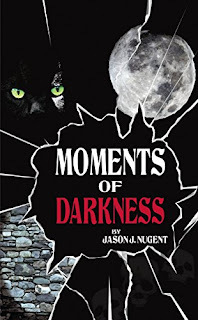 Moments of Darkness is available to pre-order from Amazon here. You can read more about Jason Nugent in our previous Q&A with him here.